The best-known attraction in Sandwich MA has something for everyone, and in the summer, Circus Smirkus. Perhaps the most famous local attraction in Sandwich MA is Heritage Museums & Gardens (tel 508-888-3300), a mile from Dexter's Grist Mill on Grove Street. Heritage does not specialize in any one era but has exhibits from all periods of American history. The automobile collection, 34 cars dating from 1899 to 1936, is one of the most popular sights in town. Another collection features firearms and military miniatures, and still others show American crafts and the tools used to perform them. The buildings and grounds of the plantation are an attraction in themselves: all are reproductions of early American buildings (including a superb Shaker-style stone round barn) set in gardens and nature areas covering 76 acres (31 hectares). It's open mid-May to mid-October daily, 10 am to 5 pm. 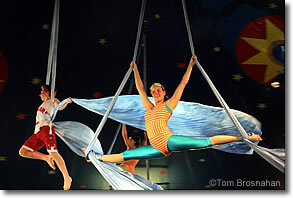 Each summer, Heritage Museums & Gardens hosts Circus Smirkus, the Greensboro VT-based international youth circus that tours New England each summer. The young performers, aged 12 to 18, are all amateurs, but the performances are of professional quality, with live, original music, tailor-made costumes and professional coaching and artistic direction. Their youthful spirit, enthusiasm and joy in performing is contagious and exhilarating, no matter what your age. 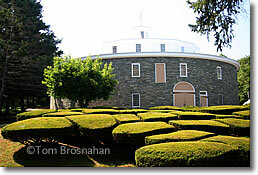 Above, the famous Shaker-style stone round barn at Heritage Museums & Gardens.